TORONTO -- Doug Ford's efforts to slash the size of Toronto's council ahead of an election was ruled unconstitutional on Monday, dealing a major blow to the Ontario premier and putting the fate of the city's fall vote in limbo. 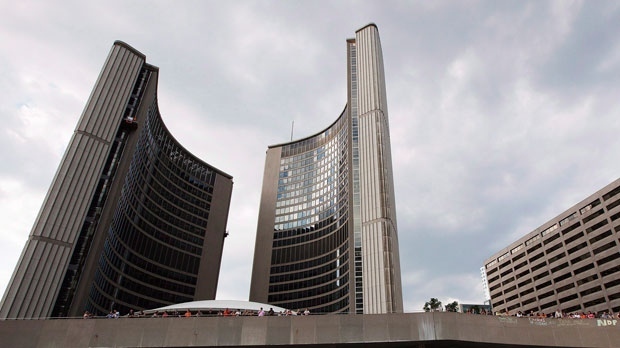 Bill 5 cut the size of Toronto's city council from 47 seats to 25, aligning them with federal ridings, despite the fact that the campaign for the Oct. 22 election was already underway. City lawyers contended that reducing the number of councillors in the middle of an election was "discriminatory and arbitrary," and violated the charter -- arguments Belobaba accepted. Ford, who abruptly announced the coucnil-cutting plan in late July, had argued the move would improve decision-making on the council, where he served one term. He also said it would save $25 million. The premier was set to respond to the ruling at noon, but the judge has noted that he was certain the losing party would appeal. Coun. Kristyn Wong-Tam tweeted that an appeal for the province would be a "steep uphill climb." Ontario Premier Doug Ford said Monday his Progressive Conservative government would invoke a rarely used notwithstanding clause in order to go ahead with its plan to cut the size of Toronto city council despite a court decision that ruled the move unconstitutional. "There is no evidence that any other options or approaches were considered or that any consultation ever took place," Superior Court Justice Edward Belobaba wrote in his decision. "It appears that Bill 5 was hurriedly enacted to take effect in the middle of the city's election without much thought at all, more out of pique than principle. "